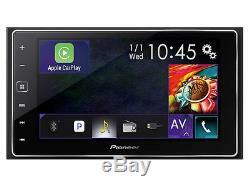 Pioneer SPH-DA120 MP3/USB In-Dash 6.2 Touchscreen Digital Media Car Stereo. Full-color 6.2 LCD touchscreen display. Apple CarPlay (compatible with iPhone 5 or later). AppRadio 4 Functionality for iPhone and Android Phones. Loaded with new audio settings to enhance your listening experience. Provides high-res FLAC file playback. MirrorLink Compatible: Android devices Require MicroUSB to USB or CD-MU200 Mirrorloink Cable. Ensure your device is MirrorLink compatible. Power Output: Peak: 50 watts x 4 channels. RMS: 17 watts x 4 channels. MP3 ID3 Tag Display (Title/Artist/Album). Playback of MP3, WMA, AAC, WAV, FLAC MPEG-1, MPEG-2, MPEG-4, AVI/DivX, WMV and JPEG Photo Slideshow via USB. Compatible with Apple iPhone 5 and iOS 6 software. 13-band parametric equalizer with 7 selectable tone curves. 24-bit Digital Analog Converter (DAC) to enhance your MP3/WMA playback. 3 Sets of 4V preamp outputs (front, rear and subwoofer). AppRadio Mode Functionality for Android Phones. AppRadio Mode for Android compatible with the following Android Devices. AppRadio Mode functionality for early model iOS devices (30-pin connection) require Pioneer CD-IU201S cable. Front Auxiliary Input: 3.5mm headphone jack allows connection to portable media devices such as MP3 players. Front and Rear USB Input: USB port allows connection to digital devices such as flash drives, portable media players, etc. Dedicated Backup Camera Input: Used for universal rear view cameras with an RCA composite input. Rear RCA Video Output: Used for connection to separate monitors and other devices. Rear RCA Audio/Video Input: Used for connecting video accessories such as game consoles, video cameras, etc. Built-in Bluetooth technology for hands-free talking and audio streaming. Bluetooth range up to 32.8 ft. Supports SMS message notifications and A2DP audio streaming. A2DP: Advanced Audio Distribution Profile allows high quality audio to be streamed from an audio device to the car stereo. AVRCP: Audio/Video Remote Control Profile supports basic remote control functions (play, pause, etc) via Bluetooth. OPP: Object Push Profile for sending basic "objects" such as pictures and other virtual material. SYNC: Synchronization Profile enables the synchronization of Personal Information Manager (PIM) items. SPP: Serial Port Profile provides a wireless replacement for RS-232 based serial communications. Works with most Bluetooth enabled cell phones. Includes a external wired microphone for clear, convenient and distortion-free talking. 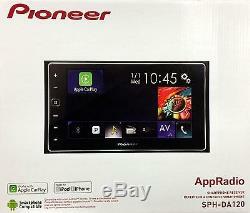 The item "NEW Pioneer SPH-DA120 MP3/USB In-Dash 6.2 Touchscreen Digital Media Car Stereo" is in sale since Saturday, May 20, 2017. This item is in the category "Consumer Electronics\Vehicle Electronics & GPS\Car Audio\Car Audio In-Dash Units". The seller is "yourbestelectronicssource" and is located in Keyport, New Jersey.